Other than maybe a helmet, nearly all motorcyclists are entirely exposed and vulnerable to injury. A collision with a motor vehicle can leave a motorcyclist severely or catastrophically injured or even dead. Experienced and aggressive motorcycle attorneys can help victims and their families. Here are five reasons why such accidents are almost always the fault of the driver of a motor vehicle and not the motorcyclist. The most common forms of distracted driving involve the use of a cell phone while talking or texting. Distracted driving might also include using a navigational device, eating, smoking or attending to personal grooming. When it comes to colliding with motor vehicles, the most common traffic configuration is the motorcyclist going straight ahead and the driver of a motor vehicle failing to yield the right-of-way and turning left in front of the motorcycle. In the overwhelming percentage of these left-turn accidents, the driver of the motor vehicle either never saw the motorcycle approaching or didn’t see it until it was too late. In nearly half of all accidents between motor vehicles and motorcycles, the driver of a motor vehicle fails to see the bike because of glare from the sun or bright lights. At other times the motor vehicle driver doesn’t see the motorcycle because it was obstructed by other vehicles. The same as an automobile might be rear-ended when stopped in traffic; a motorcycle might be rear-ended too. A rear-end impact can launch a motorcyclist over the bike’s handlebars and into traffic approaching from the opposite direction, a stationary object or onto the pavement itself. Victims have little control over where or how they might land. Motorcyclists know better than to ride in a motorist’s blind spot, but sometimes they end up in those locations without a choice. A motor vehicle changing lanes can sideswipe a motorcyclist or cause him or her to take dangerous evasive action into another lane where the motorcyclist might be hit. 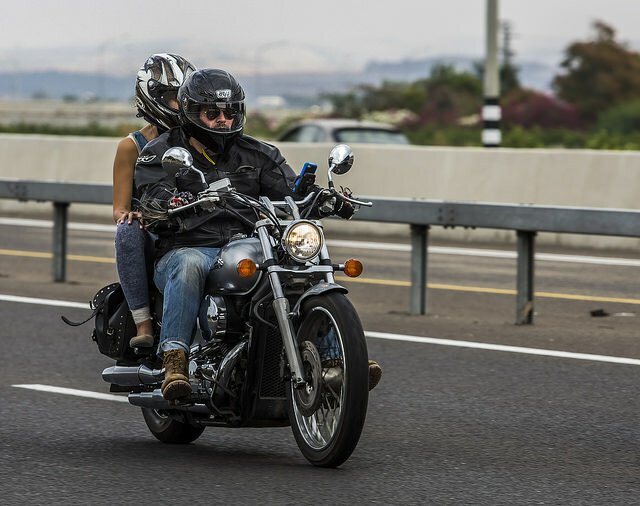 Motorcycle attorneys can help a severely injured motorcyclist or the family of one who died in a crash through their financial and emotional losses and hardships. If you are injured in an accident, or if you lost a family member in one, you can contact us for a free consultation and case evaluation. No legal fees are due unless we obtain a settlement or verdict for you.